Luxury Oceanfront Condo on Chac Mool beach, in the heart of everything! Available for three month lease or longer. Make this your winter home away from home! This spacious (1900 square feet), beautiful new condo is on Chac Mool beach. This is a great location in the Hotel Zone. It has gorgeous views of the Caribbean as well as Laguna Nichupte. Dozens of dining, shopping and night-life options are all within easy walking distance. The large private terrace has a Jacuzzi tub and wonderful views of the turquoise water. Swim in the large infinity pool or the warm waters of the Caribbean. Boogie board right off the white sand beach. Or just enjoy the warmth, sunshine and gentle breezes of this tropical paradise. Explore the Mayan archeological sites or visit eco-archeological parks like Xcaret or Xel-Ha for fascinating day trips. This nicely furnished condo is on the 11th floor of a secure complex and includes covered parking. The second bedroom has two comfy double beds (trundle) in addition to the pillow-top king bed in the master and a double hide-a-bed in the living room. Portofino has a full service Spa and a well equipped gym. Professional couple who love Cancun. Great weather, beautiful water and beach. Close to everything. We enjoy walking on the beach, finding shells, swimming, boogie boarding....all right there. Scuba, sailing, dining, etc, all convenient. Dual air conditioning controls. One for bedrooms and one for the rest of the condo. Ceiling fans in bedrooms and all living areas. WiFi in in condo as well as common areas. Passwords in guest folder and office. (2) Large flat screen TV with satellite cable in TV area and master bedroom. From January 2013 for a period of 3 months we have rented, appreciated and taken care of this beautiful condo. The ocean view is splendid and we really enjoyed the privacy while taking our meals on the patio near the jacuzzi. Like shown online, each of the two bedrooms (with private bathroom, shower and walk in) are spacious and have a view on the lagoon. The two living rooms and the dining room are vast. The kitchen is rather well equipped and the dishwasher is brand new. The washer and dryer are very useful. The air conditioning with two separate controls is running very well. The TV screens with Sky satellite in the living room and master bedroom are useful. The only thing missing would be internet access indoor. Portofino (direct on the beach) is modern, clean and safe. The installations are up to date and the employees are thoughtful and friendly. The infinity pool and the hot tub are perfect for all. A playground for children makes for a complete environment. Pepe and his funny staff members operate the Pool Bar (Wi-Fi access): they serve drinks and good meals from 10AM to at least 6PM. Unfortunately, the GMY has been closed for renovation since end-February. When hanging out on the beach, the chairs and palapas are perfect for relaxing after swimming. Most of the time, the ocean has strong waves, but it’s perfect to enjoy boogie boarding. Near the gate of Portofino, there is a drugstore, two convenient stores (Oxo and Extra) and a fast-food restaurant (The Surfin Burrito) all open 24/7. There is also a nice restaurant called Le Natura. Across the street, there’s the popular restaurant and bar Senor Frog’s. At night, we rarely heard noise coming from there, but when we did, it’s nothing earplugs couldn’t fix. In a 4 minute walk radius, there is Coco Bongo, Carlos’n Charlie’s, Hard Rock Café, Chili’s and numerous bars... the heart of Cancun by night!!! In Flamingo Plaza, we recommend Outback Steakhouse (where you can watch special sports events). Nearby, you can find Bubba Gump and Margaritaville. During our stay, we have received three groups of visitors. They all had a pleasant trip and were very impressed with Portofino and Cancun. With our guests, we went on many tours. We recommend without reserve this condo for his best quality / price ratio and his strategic location. Great Luxury Condo in great location!! Our family of four (with two young adult children) just returned from the Christmas week at this property and had a great time. The condo is large, clean and well equipped and very comfortable. We loved the fact that there are only four units per floor and only two units per floor serviced by two elevators each…no waiting (unlike the large all inclusive hotels)…it felt very private and exclusive. The view from the balconies was spectacular – one onto the beach, the ocean and the sunrise, the other the lagoon, the beach strip and the sunset!! The best part was the incredible beach and very large pool facilities. Even the pool bar and snack shack served excellent food. It never felt crowded like so many all inclusive hotels might be. The condo has plenty of beach towels, boogie boards and all the amenities to make the stay very comfortable. The kids took surfing lesson twice on the beach directly in front of the condo since the instructors said that is where the best waves were. The staff at the condo were superb and the condo property itself is very safe with controlled access for visitors via wristbands. We decided to rent a car for the week even though it probably wasn’t necessary as there is readily available public transit and taxi service directly out front. This allowed us to travel on our own to Tulum, Puerto Morales, Xel-ha, Isla Mujeres and visit downtown Cancun on several occasions. Within a 5-10 minute walk there are dozens of restaurants (must visit Surfin Buritto next door whihc became our morning ritual! ), shops and clubs and within 2km either way are the best high end restaurants and luxury malls (highly recommend La Habichuela, Fred’s, Cenacolo, La Palapa Belga and Rio Churrascaria). The main thouroughfare (Kukulcan Road) can be quite busy in the evening with traffic at times stop and go and noisy from Senor Frogs but it was not a big distraction. The owner Tom was also very helpful in vacation planning as well as was his management team in Cancun. Loved it and we will definitely be back. I am glad you loved the condo as much as we do! Let us know when you wish to visit Cancun again. We recently stayed at this property (Aug 1-10, 2011) and had a wonderful time. We were three adults and two kids but the property can easily accomodate up to six people. The condo is well equipped and very comfortable. Two bedrooms and two large bathrooms. 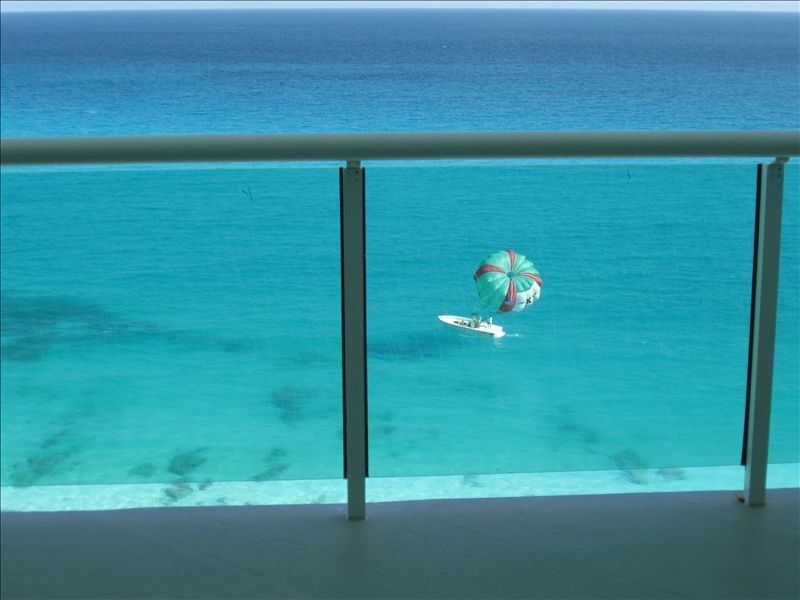 The balcony is huge and has amazing views of the beach; it also has a whirlpool, which is great for relaxing. The amenities at the Portofino are great: gym, tennis court, big pool, cafeteria, you name it. The Portofino also has a great location as it is within easy reach (either walking or by short bus rides) from malls, restaurants, etc. The people at the management company were knowledgeable and corteous and help keep the apartment in great condition. Tom, the owner, was very helpful, it was a pleasure dealing with him. In summary, my family and I loved this place and look forward to staying there again soon! We agree this is an ideal family vacation home base! Just returned from 10 nights in this condo, and can't say enough great things about it. The condo is very spacious and clean, with a huge main balcony that looks straight out at the beach and ocean, and straight down at the pool. Looking left and right gives you terrific views all up and down the hotel zone. Staffed security gate made you feel very secure. The 2 full baths were great. We have 2 young kids, so the privacy afforded by having our own bath was nice. Biggest shower I've ever seen! And HUGE closets. The trundle bed situation in the 2nd bedroom was ideal for us, as it afforded each child more than enough room at night. The Master BR has a balcony that looks out over the lagoon (and Senor Frogs!). We had read other reviews from people that had stayed in other condos in this building, and they complained about the noise until early morning from Senor Frogs. In the case of this unit, we didn't find it to be an issue. Perhaps it was the fact that this is an 11th floor condo, or perhaps because we generally slept with the sliding door closed. The fully equipped kitchen was great. Fridge, dishwasher, stove, microwave, coffee maker, blender and toaster. All the comforts of home. Plus plenty of dishes, glasses and silverware. There were more than enough very nice bath towels, and even 4 nice beach towels to take to the pool—nice because we didn't have to bring our own. The washer/dryer was invaluable. It allowed us to pack for only 5 days, thus cutting down on luggage. The management staff was great. Arranged for pickup from the airport (a person out front, holding a sign with my name on it—a first for me! ), and would arrange taxis anywhere you wanted to go. We went to both Costco and Walmart. Next time I think we'd probably skip Costco, as the Walmart was nice, and had everything you need, from produce to beer. Found out after a couple of days how easy it was riding the bus. There's a stop right in front of the building, going in either direction. 30 pesos for 4 people. Pharmacia right out front, and an Oxxo convenience store 50 yards from the gate. Great for bags of ice and quick necessities. Walking distance to Forum by the Sea mall, which has Carlos & Charlies (went 3 times! ), Hard Rock, Rainforest Cafe, and it's right in amongst all the night life. Short bus ride south is La Isla mall, with tons of shopping and a number of very good restaurants. All in all, definitely an excellent place to vacation. We would rent this unit again in a heartbeat! 90 day or longer rental required. Utilities included in rate.